Fully equip, functional, awesome RV. Perfect for two adults and two non-adults, up to six (not advised) . Huge area above cab. Toilet, shower, three burner stove. Refrig/freezer. All the comforts of larger, more expensive rigs. 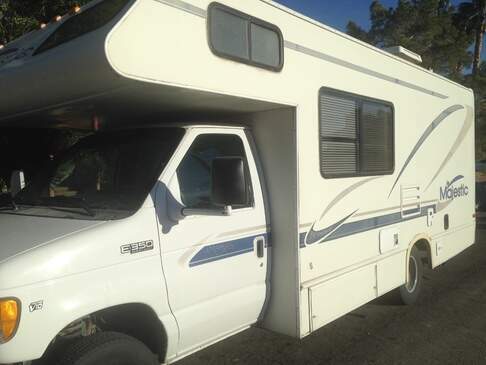 Comes complete with bedding and cooking supplies. Just bring your food. 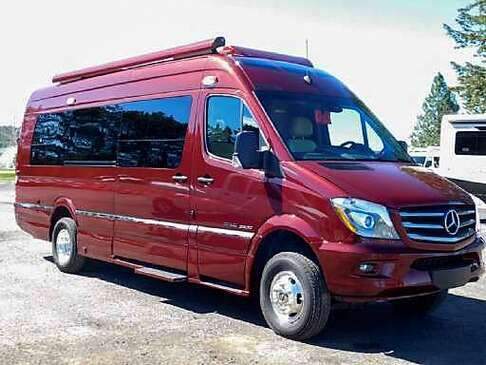 Built on the renowned Mercedes-Benz Sprinter Chassis and designed for life on the open road, the CS Adventurous makes taking in the sights an enjoyable and comfortable experience for all. Solar Package. Bike rack also available for use. There is no joy better than going camping with our ultimate vacation machine. With its compact size and peppy, fuel-efficient Ram Promaster chassis, the Itasca Viva can go where ever your heart takes you. You will enjoy popular features such as LED lighting and Ultraleather cab seats including a StudioLoft@ bed with power lift so its easily up and out of the way when you don't need it. HAPPY CAMPING!!!!!!! 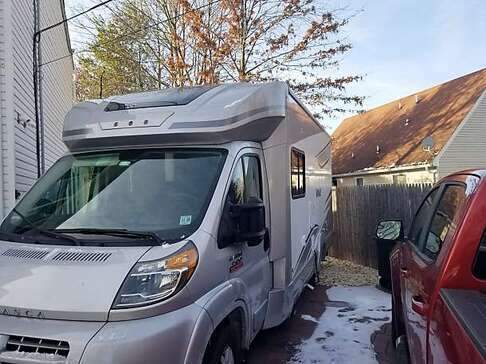 Loaded toyhauler for a great get-away. Take your bikes, kayaks or atv with you. 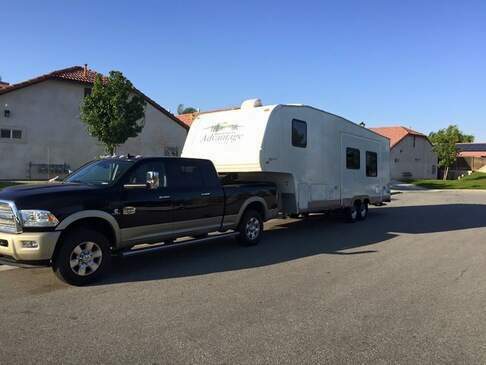 Towable with a half ton or large SUV with tow package (we tow it with our Chevvy Tahoe). Can sleep 6 adults or squeeze in lots of kids with the lowering queen bed. 2 fold down full size beds that convert to sofas, a double bed in front. DVD, TV, with surround sound,furnace and air conditioner for the comforts of home. Outdoor led lights. Fueling station and outdoor rinse hose for your toys or messy kids. Folding table, grill, hammock and camp chairs for outside, cooking pots, pans and utensils included in rental. Generator and neccesary camper accessories also included in rental. 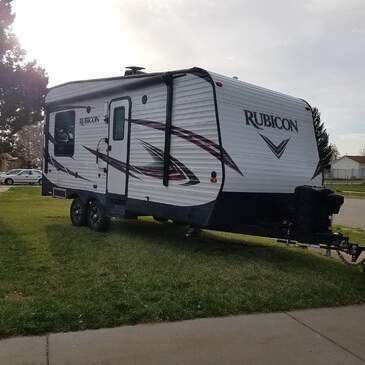 Toy hauler, garage door is on front right hand side of trailer, tie downs and vents, two found down bunk in garage with 150 lbs capacity, TV with DVD player in garage. 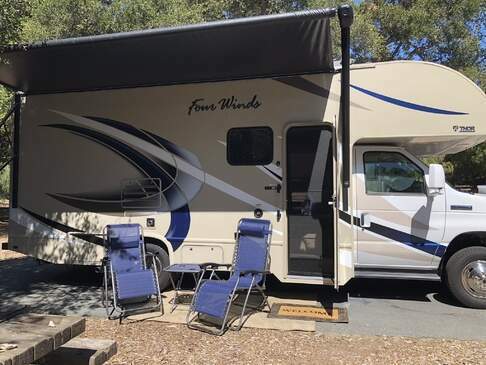 Electric fireplace, couch that turns in to bed, DVD/CD, Radio, kitchen sink, dining table that converts to bed, stainless appliances, stove, oven, microwave, range hold and refrigerator freezer, plenty of storage, main bedroom is camper king mattress. Two slide outs, outdoor shower, outdoor two burner stove with sink. 30/50 amps, gas or electric hot water heater, power cord, all water and sewage hoses. can provide sheets and towels just bring your own pillows, crockpot, k-cup coffee maker, dishes and some pots and pans. 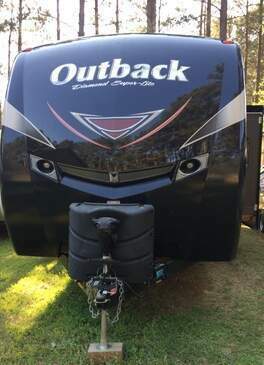 You can tow it with a mid size SUV, it's for weekend getaways & short trips. It hauls smooth & is easy to park & set up & comes with electric, water & sewer hook-up etc. 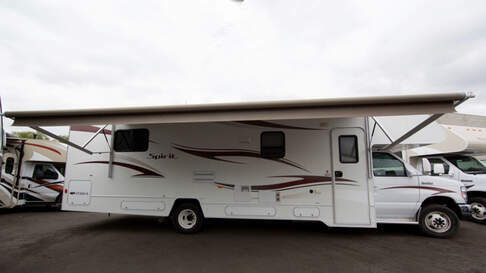 31’ fifth wheel with a slide out living & kitchen for spacious room. Ceiling fan in kitchen. Air conditioning and central heating. Separate bunkhouse with bunk beds which are larger than twin slightly smaller than full size. Separate queen size bed in master bedroom. Couch folds out to bed and dining room table converts to bed potentially sleeps 8. Bathroom has shower and small bathtub for kids or small adults. Flat screen tv. Surround sound stereo system. Oversized awning. Comes with portable silent generator fresh water holding tank and waste water tanks for dry camping. Along with outside shower. I will deliver to camp site and set up for additional fee. Fee depending on distance required. 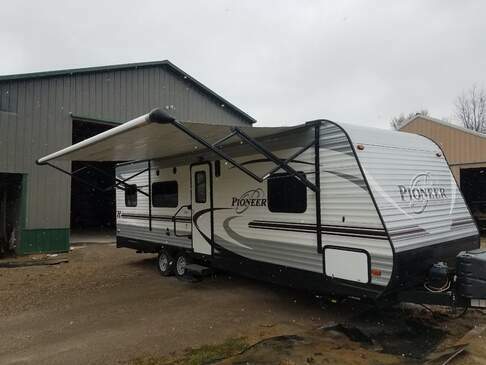 Toy-hauler with tie-downs .. removable kitchen table,, two fold-down seats/bunks in toy hauler area,, two 20 gallon propane tanks.. 6 foot rear ramp.. linens for bed.. 2 USB ports.. retractable antennae, two TV's.. Electric stabilizer and tow jacks. Stabilizer jack are just for stabilizing, not jacking it up. Portable hydraulic jack and electric heater and 4 screw jack. Bath towels and wash cloth for bathroom, Cutting board film, kitchen utensils, pots and pans. Central gas heater and AC. Microwave. Awning light. Water Hose, Sewer line and TV cable.